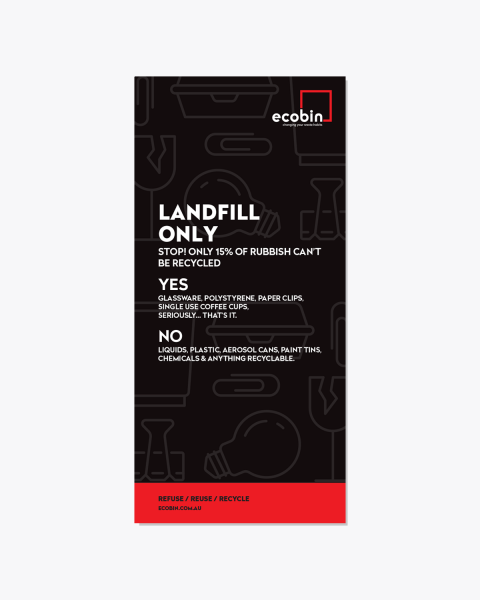 Our range of Ecobin recycling bin bundles are designed to assist offices, schools and public indoor spaces to have Ecobin’s range of recycling bins in a convenient easy to purchase set. 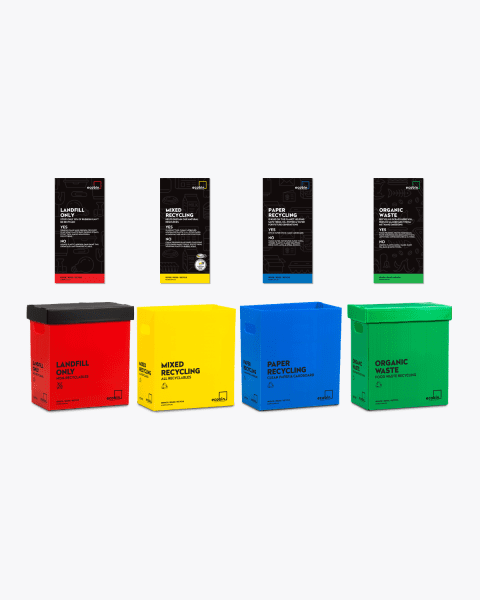 We have a range of bundles that are available in our original bold coloured range of recycling bins which are 100% recyclable at the end of their life; suitable for popping into your curb side collection bin. Ecobin also offers a bundle option for our beautiful range of FLIP bins which are also made from post-consumer recycled plastic, and feature a self-closing lid to keep odours in and bugs out and are fully recyclable at the end of their life. Our indoor bin bundles are available in a range of styles, including with, or without a lid and smaller versions for areas with limited space, these indoor bins are perfect to keep you accountable with your recycling and office waste management. 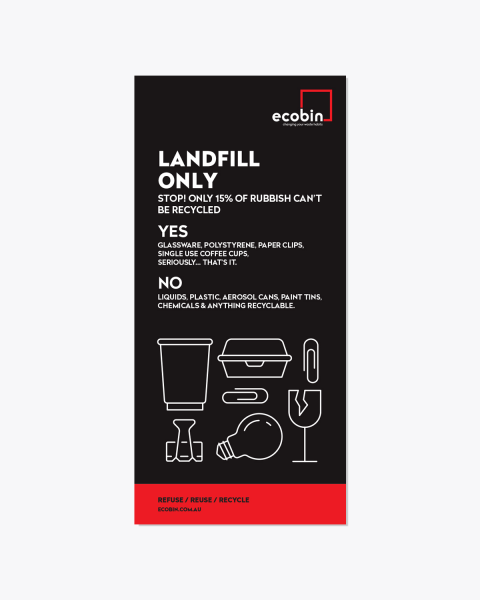 Ecobin’s range of indoor bins are the best tool to help divert unnecessary waste being sent to landfill by separating your waste at the time you throw it out. 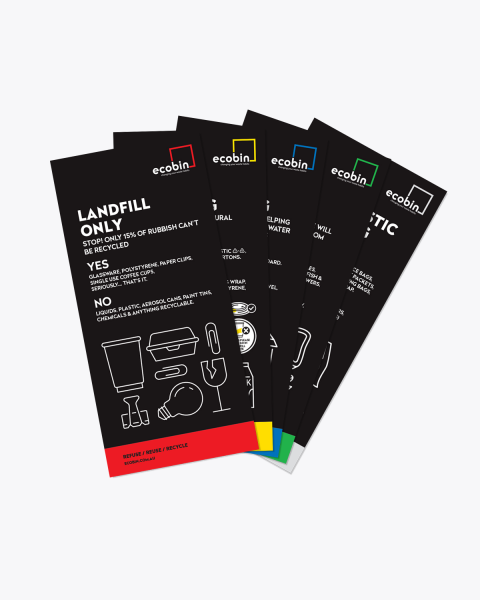 You may also select a bundle option that includes our Educational Laminated Posters with your corresponding Ecobin in either Paper (Blue), Organic (Green), Mixed Recycling (Yellow), Soft Plastic (White) and Landfill (Red) will ensure that all your staff, students, or clients know exactly where to put the correct items and ensure the effectiveness of your office waste management program. The Ecobin indoor recycling bins are available in a range of bundle options. There is the original bold coloured range of indoor bins which are available in different bundle options. 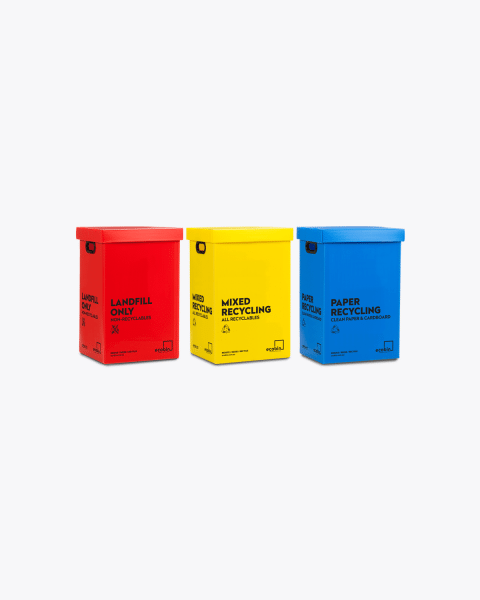 There is a set of 3 bins which includes Landfill (Red), Mixed Recycling (Yellow) and Paper (Blue) and is available in both 25 litre or 60 litre bundles. The Workstation Combo includes a Paper (Blue) deskside recycling bin and Landfill (Red) desktop mini bin. 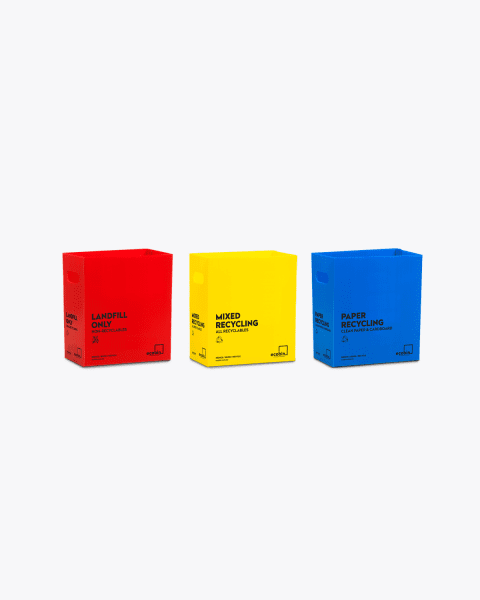 The Childcare Centre bundle which includes the Landfill (Red), Mixed Recycling (Yellow), Paper (Blue) and Organic (Green) in the 25 litre size and corresponding Laminated Educational Posters. 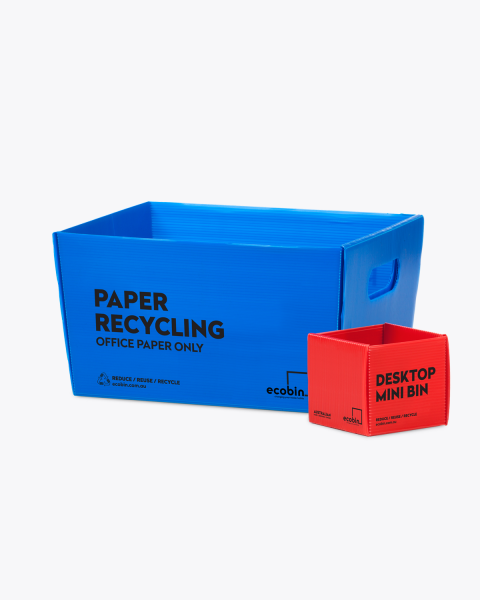 There is also an Office Waste Bin Kit Out bundle for 20 staff which includes our original Landfill (Red), Mixed Recycling (Yellow), Paper (Blue) and Organic (Green) in 60 litres, 20 x Paper (Blue) deskside recycling bins, 20 x Landfill (Red) mini bins and one set of Laminated Educational Posters. Ecobin’s range of indoor recycling bin bundles are also available in our new FLIP bin range. 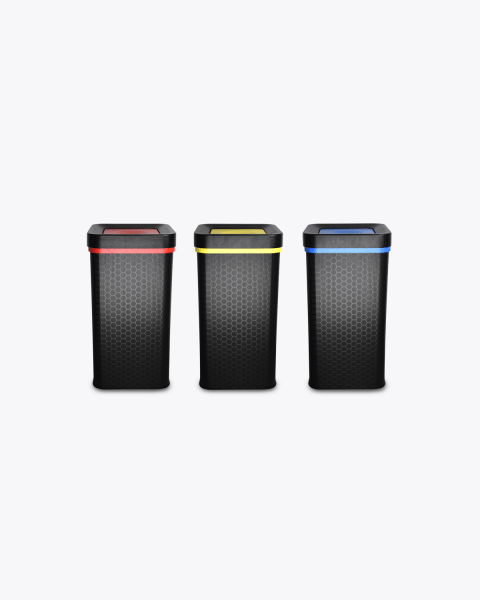 The FLIP bin bundle includes a set of 3 bins, which includes Landfill (Red), Mixed Recycling (Yellow) and Paper (Blue) in the 60 litre size. Ecobin has proudly partnered with Reverse Garbage because just like them, we’re passionate about changing waste habits. Reverse Garbage has been changing the way we look at waste for over 40 years. Each year Reverse Garbage accepts approximately 35,000 cubic metres or 100 football fields of items which could otherwise end up in the bin and sent to landfill. What an achievement! Ecobin is proud to offer our Reverse Garbage Starter Bundle which includes our original bold coloured range Landfill (Red), Mixed Recycling (Yellow) and Soft Plastic (White) bins, lids and corresponding Laminated Posters. Ecobin will donate $5 from every purchase of this bundle to Reverse Garbage to help them continue their incredible work.